The Alen a350 is a lightweight and affordable air purifier designed to be used in a medium to large room. They are advertised to be quiet and energy efficient. Two unique things jumped out at us from this list. This air purifier can be mounted on the wall. We like this because it frees up floor space for other things. It also means that kids and pets can't knock it over and break it. There are skins available. Just like skins can change the way an ipod looks, this air purifier can also uses skins. There are currently about 10 different skins available. They cost $65 each. The Alen a350 measures 18.5" X 8.25" X 17.5" making this a smaller air filter. It's smaller size will let it fit into smaller places. It only weighs about 16 pounds. This make it very lightweight and easy to carry around your house. Some air purifiers can weigh as much as 50 pounds. This air purifier is advertised as cleaning an 800 square foot room. For optimal use it should be used in a 400 square foot room. Some experts even say it should be used in a 250 square foot room for the best results. This makes sense. A smaller room has less air. Less air means the machine can clean it more times each hour. The Alen a350 uses a True HEPA filter. This is capable of removing 99.97% of particles 0.3 microns and bigger from the air. It can effectively remove dust, dust mites, pollen, dander, mold spores, and more. Like most higher quality air purifiers, it has a pre-filter to remove larger particles. This helps the HEPA filter last longer. In independent tests, this machine removed 98% of the particles from the air. We consider those very good results. There is also a small charcoal filter included to help remove odors. This filter's small size means that it is not very good at removing odors, VOCs, or smoke from the air. see the Alen a375uv air purifier. These 3 filter are combined into one. This makes filter changes a snap. We aren't ususally a fan of combined filters. With them we can't change just the worn out filter. With the Alen a350 this is not an issue. The warranty requires that you change the filters every 6 months. There isn't much of a chance for one filter to wear out first. The pre-filter gets dirty very quickly. You can clean it off with a vacuum. Alen also includes an optional ionizer in this purifier. This will help to keep the room clean. It can be turned on and off. It doesn't emit ozone, so it is safe for everyone to use. We just want to remind everyone to keep your receipts for new filters. 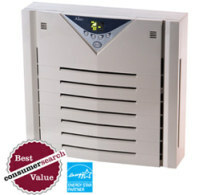 These air purifiers come with a lifetime warranty that requires a filter change every 6 months. By keeping receipts you can prove you changed the filter should the need ever arise. Our philosophy is "Better safe than sorry." We think it is better to have the receipts and never need them than to need them and not have them. Alen replacement filters can be regularly shipped to you. Alen offers an automatic filter replacement program. This will ship a new filter to you every 4, 6, or 9 months. This way you don't have to worry about when to buy a new filter. When the new filter arrives just change it right then. 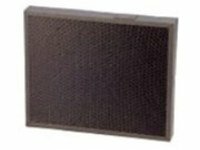 This filter includes the main HEPA filter, a pre-filter, and the activated carbon filter. This filter has to be replaced every 6 months. The filter cost about $60 dollars. Alen also offers two other types of filters for this machine. The Silver ion filter. It is the same filter with Silver ion added to it. This will kill bacteria, viruses, and other germs. It cost about $70. The MCP Gas, Smoke, and Odor filter. This filter is supposed to remove odors and smoke. It is about $90. Like all Alen Air Purifiers, the Paralda has a lifetime warranty. The warranty requires you to replace the filter every 6 months. 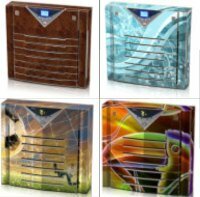 Most customers reviews of the Alen a350 air purifier are positive. It removed the dog smell for my apartment. It improved my allergy symptoms so I can take less medicine. It's quiet enough to use in the bedroom. It decreased the amount of dust on the furniture. It's noisy on the higher speeds. Customer service is not easy to deal with, but they did finally replace the defective unit. We feel good recommending this product. This is a very affordable and efficient air purifier. It will do a great job cleaning the rooms in your house. The replacement filters are not expensive. It uses True HEPA filters. It has an ionizer that can be turned on or off. It has a lifetime warranty. You can rest easy knowing that if it ever breaks, it will be replaced. We would recommend the Alen A350 for allergy and asthma suffers. And anyone else who wants to breathe in fresh, clean air. Leave Alen A350 Air Purifier Page and Return to Alen Air Purifiers Page. Leave the Alen a350 Air Purifier Page and Return to All About Air Purifiers Home Page.